You may not be vegan, or even vegetarian, but these 5 quick & easy dinner ideas can still satisfy a hungry family when you’re pressed for time in getting dinner on the table! 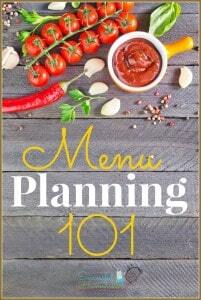 The plant-based meals will please every palate! Thanks to Evelyne McNamara of The Vegan Reset for sharing this post! Not because it’s that difficult or time-consuming. I hate it because everyone in my family has completely different foods that they don’t like or are tired of. There’s only a handful of dishes they all agree on and I don’t want to have them repeated every week. You want to please everyone but you can’t. So it’s a chore made worse because you know you’re not winning any popularity contests. When you plan out the week, you also want to be sure that the meals have the right vegetables and that they will eat them and not just shove them aside for the main course. You meant to thaw out the sauce you were going to put on pasta, but you forgot. And you also forgot to buy pasta and the teenagers finished what you had in the pantry. When you have a crazy week with kid activities, overtime, and everything else we all deal with, you need a fallback position for making dinner. 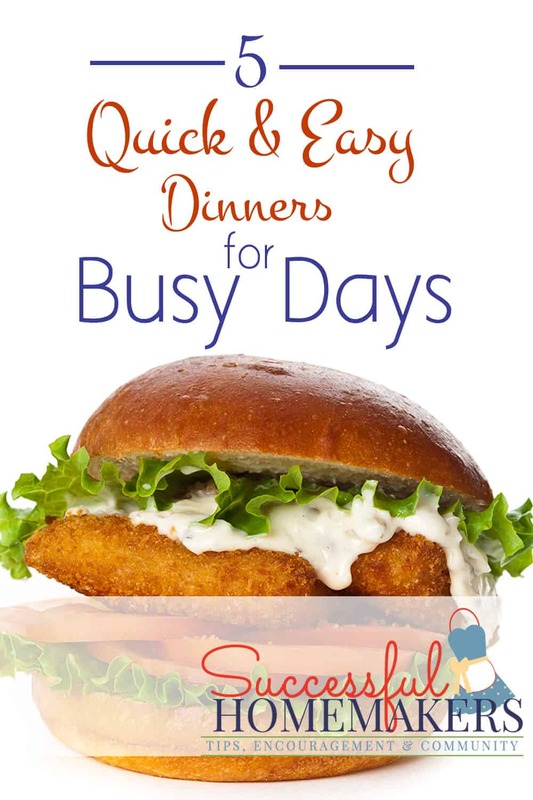 You need easy dinners for busy days. Dinners that you can make with a few things you have on hand. Something that you can throw together in 5 minutes and that is delicious and nutritious. Or at least mainly nutritious. Speed and convenience over other details. These quick and easy dinners for busy days need to be kid and budget-friendly and they need to use a minimum of ingredients. They can’t involve pre-cooking or anything that can’t be bought or fixed in minutes, but the inventive use of leftovers is definitely ok. Go! You can always go with the classic PBJ or grilled (vegan) cheese, but why not think outside the box? Leftover prepared tofu and sliced cucumbers with a sweet chili sauce make a great sandwich filling! Run out of bread? Use tortillas, bagels, waffles or even lettuce leaves if you can’t find a suitable filling-to-mouth conveyance. Try combining some cheese with pickle relish and mayo. Or sliced apples and cheese! Avocado & shredded carrots with a soy sauce-wasabi spread for a sushi sandwich. Thawed meatless balls with leftover pasta sauce make for a fast meatball sub. Caramelize some onions and garlic and toss ribbon-cut kale to wilt before filling whatever bread you have around. Even roasted vegetable leftovers can be sandwich material when you add a salad dressing as a sauce! We love burritos! 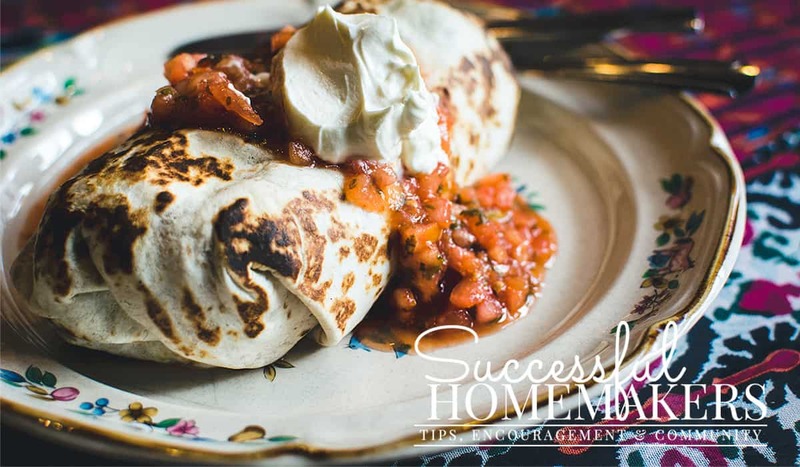 Big flour tortillas can be wrapped around anything to form an edible packet to have at home or take on the road. Do you have a can of black beans in the pantry? How about some fresh or pre-cooked vegetables in the fridge or freezer? With the addition of some spicy sauce, you have all the important makings of great vegan burritos! How about frozen hash browns (my freezer always has those pre-formed hash brown patties from Trader Joe’s) and vegan breakfast sausage? Roughly mash some firm tofu, mix everything together and cook up a yummy breakfast (for dinner) burrito! Leftover pasta? You’d be amazed what a yummy burrito filling it can be! Really, really low on everything? Your kids are not likely to complain if you make them PBJ burritos with some crunchy cut up fruit added! In a pinch, you can use frozen fruit thrown quickly in the microwave to thaw out. Do yourself a favor and keep some pre-made pizza dough in your freezer. It could be handmade, or you could buy it pre-packaged from your grocery store or Trader Joe’s. 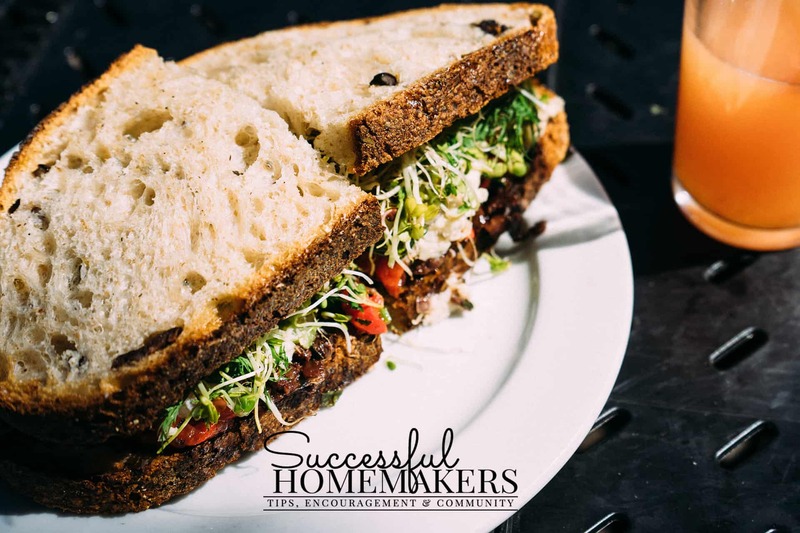 It does require that you take it out at least an hour before dinner has to be prepared, so save this option for when you know ahead of time that dinner will be rushed and put the dough in the refrigerator in the morning. You can also buy pizza shells at most stores. These come in plastic packages and will keep for some time in your pantry or fridge. If you put them in the freezer, they just need a quick thaw in the microwave. Naan bread also makes a great flatbread version of a pizza shell. You can also toast flour tortillas in the oven if you want very thin crispy pizza and have nothing else in the house. cheese, frozen crumbles, frozen breakfast sausage, roasted vegetables, canned mushrooms and olives, canned pineapple, canned corn, pesto sauce, sundried tomatoes, BBQ sauce, canned artichokes, frozen spinach, avocado with fresh cilantro (bake the shell first), sweet potatoes and red onions, hummus. frozen fruit with Kite Hill ricotta and maple syrup, figs, rosemary and shaved almonds, blueberries, Kite Hill ricotta and caramelized onions are just a few of the combinations you might try. A can of garbanzo beans can save the day with just a few key additions (and don’t forget to save the liquid to use in aquafaba recipes). Add some cut-up fresh vegetables, and your favorite Asian sauce and serve over brown rice (buy the pre-cooked frozen brown rice to keep on hand for just these kind of days!). Instant Buddha Bowl. Combine the garbanzo beans with another canned bean or two. Add sliced fresh green onions or red onions and vinaigrette or salad dressing and voila! Three Bean Salad in a hurry. 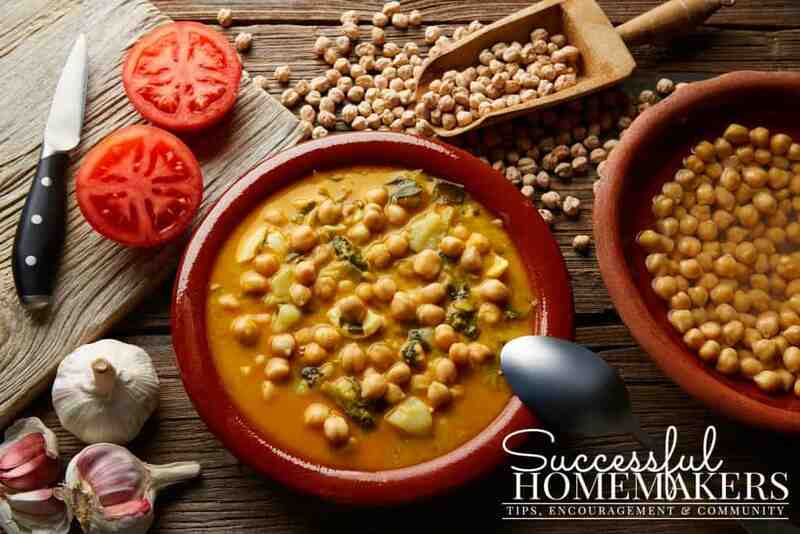 Add a can of coconut milk to the garbanzo beans and bring to a simmer. Mix in a cup of dried red lentils and enough water to just cover and cook for about 15 more minutes. Season with red pepper flakes, salt, pepper and the juice of half a lemon. Put some corn tortillas in the oven to toast and warm. Mash the garbanzo beans roughly. Add about ½ to 1 cup of shredded carrots, then ¼ cup of vegan BBQ sauce. Warm in microwave for about 1 ½ minutes. Serve the mixture on the corn tortillas. I really do try to keep to clean foods and avoid preprocessed meals. In an overall health plan, that’s always going to be the best policy. But we’re talking emergency dinner aid here and these foods have their place in a culinary rescue time. I always keep some Gardein fish fillets in our freezer. I don’t know how they manage it, but these fillets taste like the real deal and will satisfy even the non-vegans in your family. I’m sure you can come up with more combinations but I keep it simple. Cook the fish fillets on the stovetop or in the oven and serve on hamburger buns with a slice of a mild cheese and a spoonful of tartar sauce (you can make a quick one with Hampton Creek’s Just Mayo and pickle relish). So, so good! Serve with chips (or a side of vegetables if you have them in the fridge). There will always be crazy days and late dinners. But if you keep a few essentials in your pantry and freezer, you’ll be confident that you can pull off a miracle and get dinner on the table quick! 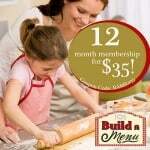 Think about what your family likes to eat and stock up on the ingredients you need to make easy dinners for busy days. 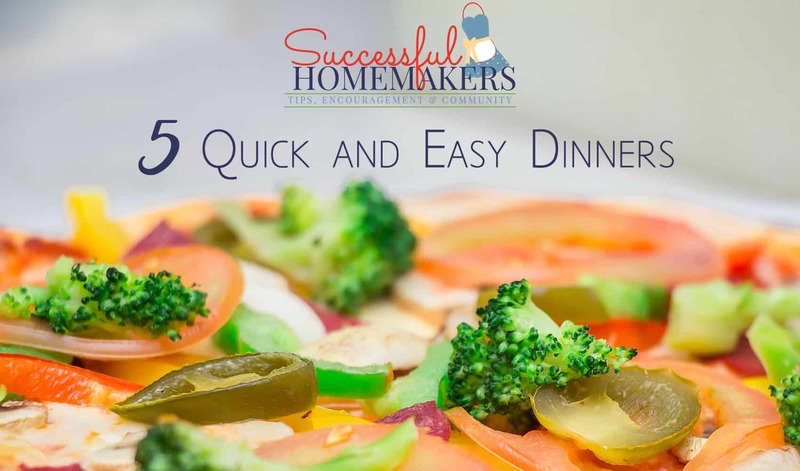 Do you have any quick & easy dinners for busy days? Share in the comments!